Perhaps you, too, have found yourself sighing wistfully at the many rustic treehouse hotels and impossibly cozy Airbnb cabins and clever industrial crates-turned-luxury suites on Pinterest and Instagram. Keep dreaming, kid, because most of them are luxury accommodations aimed at the extraordinarily wealthy and the upper echelons of social media influencers. Those glass igloos in Finland? Upward of $500 per person, per night -- which admittedly seems more reasonable after you’ve looked at, say, the underwater hotel in Fiji, where a romantic week for two starts at $30,000. No real human has that kind of cash to drop. To that end, we went searching for some of the more whimsical places to stay around the world in which you might actually, y’know, stay some day. Do you have three friends and an appreciation for kitschy aesthetics? What breaks down to $39 per person gets you a two-bedroom Airbnb listing shaped like a giant beagle (that it is not called Airbnbeagle is a tragic missed opportunity, but nevertheless). The price includes Wi-Fi, access to a variety of dog-themed books, puzzles, and snacks, and “in-the-dog breakfast” (owner’s description, not mine). If you’re the hiking type, head to the nearby Hells Canyon, North America’s deepest river gorge. Or just curl up on the upper story’s deck and rediscover what stars look like without whatever degree of light pollution you’ve probably resigned yourself to in your daily life. Mountain Light is a woodsy retreat that we found to be at the delightfully confusing intersection between camping and glamping. You have access to amenities like a microwave, mini fridge, library, and garden, but not so much the necessities (at least as we think of them)...like, ya know, a door on your cabin. There are 18 rustic shelters on the property to pick from, some of which feature stone fireplaces and open views of the river, one of which is literally just a bed in the woods. What Mountain Light might lack in privacy, though, it aims to make up for in fairies, gnomes, UFOs, and various other examples of what the owner refers to as "orbs". The sanctuary is donation-based, so it's up to you to decide how much a hike to a waterfall or a nap in the same spot as an invisible interdimensional being is worth. This is a place for those who enjoy a hippie-ish outlook, a playful relationship with the paranormal, good hikes, and good vibes. If you’re relatively young, an active or aspiring writer, and deemed unannoying slash unlikely to be an ax murderer, you can sleep (and shower) in this famous bookstore -- for free! In exchange, you help open and close the store each day, plus a two-hour shift reshelving books. It’s a historic spot with an extremely central locale -- by central I mean an above-average frisbee thrower could probably hit the Notre Dame from one of the second-floor windows. More than 30,000 Tumbleweeds have passed through the shop over the decades, including all your favorite Beat Generation writers. Here’s how it works: Walk in and say you’re interested in Tumbleweeding (it’s an English-language bookstore, so everyone working there will speak English) and ask for Sylvia, the owner. You can’t make a reservation, so if it’s full you just have to come back the next morning and try again; there’s only room for maybe half a dozen people at a time. This means two cots (on which customers will sit and read during the day), another one tucked into a sort of hidey-hole loft area, and floor space which you are welcome to pad with cushions from various benches. There’s also a studio above the store with an actual bed -- do not ask for this. If you stay for some weeks and prove yourself worthy, it might be offered to you, at which time you may graciously accept. At Das Park Hotel, concrete sewer pipes about 6 feet across have been outfitted with double beds and electrical outlets. These converted industrial designs are becoming more and more popular, which usually means more and more expensive, but Das Park operates on a “pay what you wish” system. The rooms are available between May and October -- you may insert your own jokes about pipes freezing in winter -- and there are shower facilities and a breakfast room out on the grounds. You will, ironically, need to bring your own toiletries, including toilet paper, but unless your preferred brand of toilet paper costs several hundred dollars this remains a good deal. Earthships are self-sustaining, “upcycled” structures designed by and for those environmentally conscious humans who want to live off the grid. The Taos desert, which is just as stunning in winter as it is in summer, is a favored location for Earthshippers. The owner of this particular Earthship built the place himself, and per his description it catches its own rainwater and generates its own electricity (don’t worry -- in addition to more impressive amenities like a greenhouse, this Earthship also has Wi-Fi for those of you not ready to give up Netflix just yet). Slightly more expensive than “free” but exponentially more luxurious than “refurbished sewer” or “available floor space,” Featherbed Railroad is a delightful collection of nine vintage, retired railroad cabooses, each with a different theme. These include “Midnight in Paris” and “Wild Wild West” and -- naturally, given the Northern California location -- “Wine Country.” Some have jacuzzis, and a few are even dog-friendly. Price includes all the good stuff like breakfast and access to the pool, library, and boat dock. Plus, there’s an old-school drive-in movie theater nearby, so this is a great turnaround point for a road trip. If you book two nights mid-week (so, between Sunday and Thursday) the second night is half-off. Like coloring books and Pedialyte, treehouses have been reclaimed from the realm of small children by adults who will actually appreciate them. Luxury treehouses around the world target those discerning adults who are able and willing to spend thousands of dollars per night for the the privilege, but I’d guess that most people who want to stay in a treehouse don’t want to spend their entire savings on staying in said treehouse. 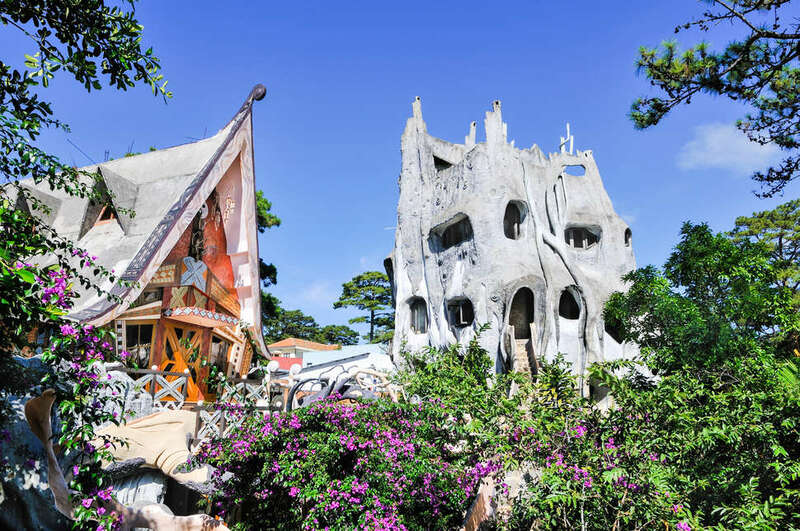 Crazy House’s rooms are spread between three treehouses. On the inside, they have the winding aesthetic of a rabbit warren, but, like, for the trippy rabbit from Alice’s Adventures in Wonderland. The proprietor, an architect who spent her career designing more conventional buildings, created the treehouses as a labor of love to help guests feel more attuned to the natural world surrounding them. All rooms have fireplaces, which is a nice touch you don’t necessarily expect when in a treehouse. Take a stroll to the lake just a few minutes east when you need to give your eyeballs a rest from trying to process just what, exactly, you are looking at. There are several venues on this list that are kid-friendly, but glamping resort Treebones is not one of those places. Despite the glamping branding, you’ll need to bring your own sleeping bag -- and tent, in case it rains -- to stay in the resort’s most unusual accomodations: the open-air Human Nest, accessible by wooden ladder. When you’re not enjoying your Nest, you can hike the surrounding Big Sur, take a kayaking tour, or, if you go during the spring, do some whale-watching. There are also on-site yoga sessions ($10 per person) and massages ($130 for 60 minutes) and even a sushi tasting menu ($90 per person) should sleeping in the Human Nest prove not adventure enough. Cost: Starts around $125 a night, or $65 for an RV/tent space. Turpentine Creek rescues exotic big cats like lions and tigers, as well as the occasional bear, bird, or monkey. You can’t pet them -- beware any facility where you can, since that usually involves tranquilizing the animals unnecessarily -- but the fact that you can hear them prowling around makes this a safari-like experience without actually having to buy a plane ticket to Zambia. You can even get a Tree House Bungalow for $175 for two people (and can add another person or two for $20 more). There are educational tours on-site as well, so this is an especially family-friendly option. All proceeds from your visit go toward the animals and Turpentine Creek’s advocacy work. Also, Eureka is just a bangin’ little Ozark town, worth a trip on its own. Guadeloupe, a French territory in the southern Caribbean, sometimes gets referred to as a single island, but it’s actually several. On the western shoreline of Basse-Terre (one of the two main islands, along with the nearby Grande-Terre) sits this multi-room treehouse woven around tall palms. To the south lies Parc des Mamelles, a botanical garden and zoo -- focused on conservation of endangered Caribbean species -- that will make you very popular with your children (or adult friends; learning knows no age limit). Best of all, it’s just a few minutes from Acomat Falls, a beloved waterfall with a bright green (in a pretty way, not a gross way) swimming hole at the bottom. Inside, you’ll find a double bed, table, shower, and -- because it would be reasonable to wonder, considering the circumstances -- a toilet.